It's easy to create cute treats with the Takeout Thinlits Dies and the Spooky Sweets Bundle. I created a simple design today to show you how you can make multiples of the same treat. You need two pieces of 5-1/4" x 6-1/2" card stock to make your little box. I recommend using Tear and Tape adhesive to hold you box together. The adhesive is on sale until Oct 6. 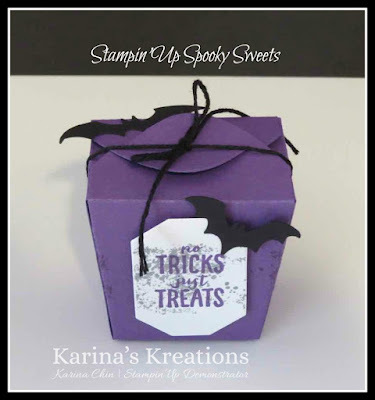 I stamp stamped my box with the background stamp from Spooky Sweets and Smoky Slate ink. The sentiment is cut out using a framelit from the takeout thinlits dies. You get 8 dies in this set. Aren't the bats cute? They are punched from Basic Black card stock. Here's a supply list for my treat holder.